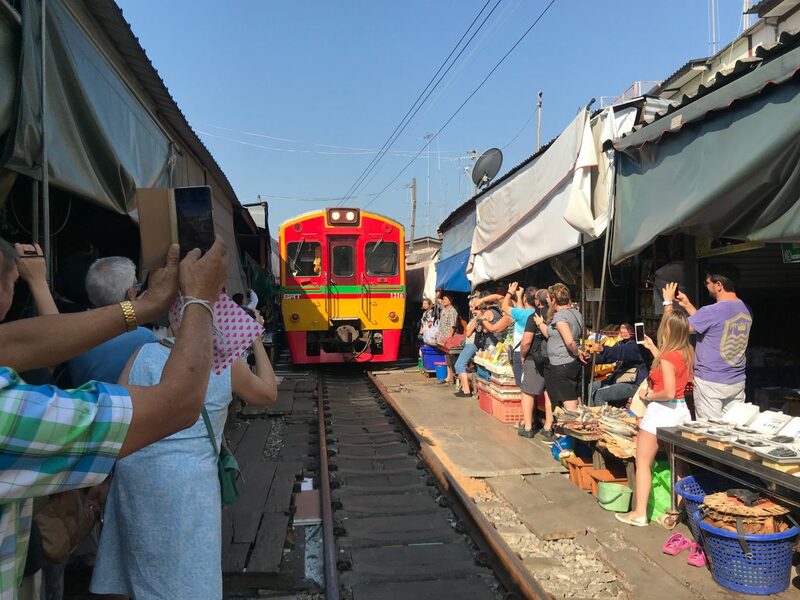 I’m sure most people who’ve looked in to visiting Bangkok have heard of the train market – there’s loads of videos online of this amazing place. It’s a market that has a train line running right through the middle of it. So when the train starts rolling towards the market, which is does several times a day, the stall owners have to bring back their canopies and pull in their goods, the train passes on through and then the market resumes. It’s a very popular place for tourists to visit, after being there I completely get why – it’s a unique experience. If you’re looking to pick up a few souvenirs you can, and because it’s an early start there are plenty of places to pick up a much needed coffee! It took us around 75 minutes to reach the market which didn’t feel long at all. We had a great guide, Tommy, who knew exactly when and where the best place was to be for the trains coming through. Be prepared to get out of the way of the train when it comes because there isn’t much room! Once we had avoided the train it was time to visit Khao Ngu – I think it’s one of the best kept secrets if you want to escape the city for the day. The literal translation of Khao Ngu is snake park but you don’t need to freak out because it’s super unlikely you’ll see on. It’s a beautiful park and I am envious of the locals who can come here to chill out and relax. There are some small stalls set up where you can buy food or drinks. There are also boats around the park if you want to be on the water. I’d never been here before so it was a really nice place to discover so close to the chaos of Bangkok. It got to around ten thirty and Tommy told us it was time to check out the coconut farm. Coconut have a big part to lay in the local economy here, at the farm we were able to learn how coconuts are used to make money; milk, oils and also sugar. I learnt a lot when we were there and it was pretty cool seeing a real traditional thai house. 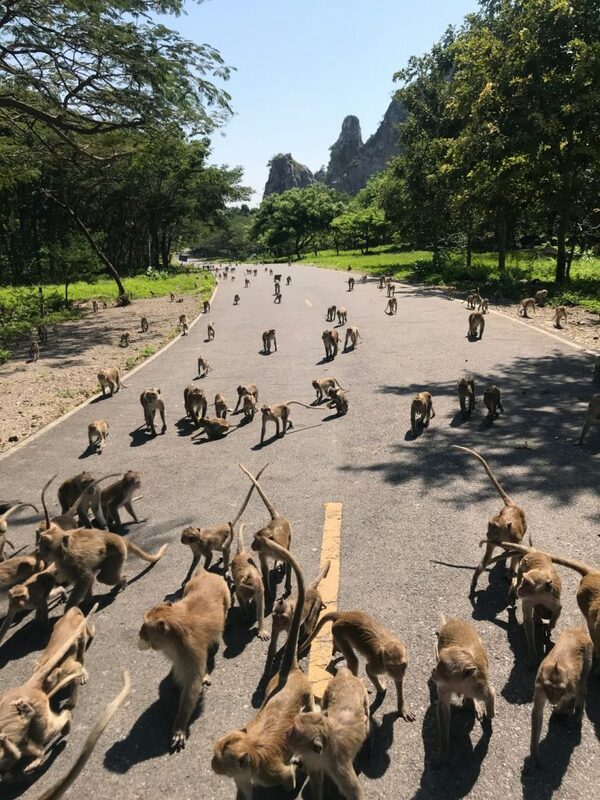 When Tommy mentioned that we’d see some monkeys I thought that it would be similar to other monkey attractions I’d seen, pretty basic and super touristy but I couldn’t have been more wrong! Some monkeys was a major understatement, more like a few hundred of them. Don’t be scared by the number of them that coming running towards you because they’re very gentle when you’re feeding them bananas (which you buy there), but do expect for them to jump all over you when the banana supply expires. After feeding the monkeys you’re ready to eat yourself. There are quite a few very well known noodle shops in Ratchaburi, with TakeMeTour you know you’ll avoid the ones aimed at tourists and eat a proper Thai noodle shop. The food was amazing, Johnny was able to get one without meat (good news for the veggies out there) – the food is all included in the price of the tour. Everything on the tour is brilliant but this is what people look forward to most. 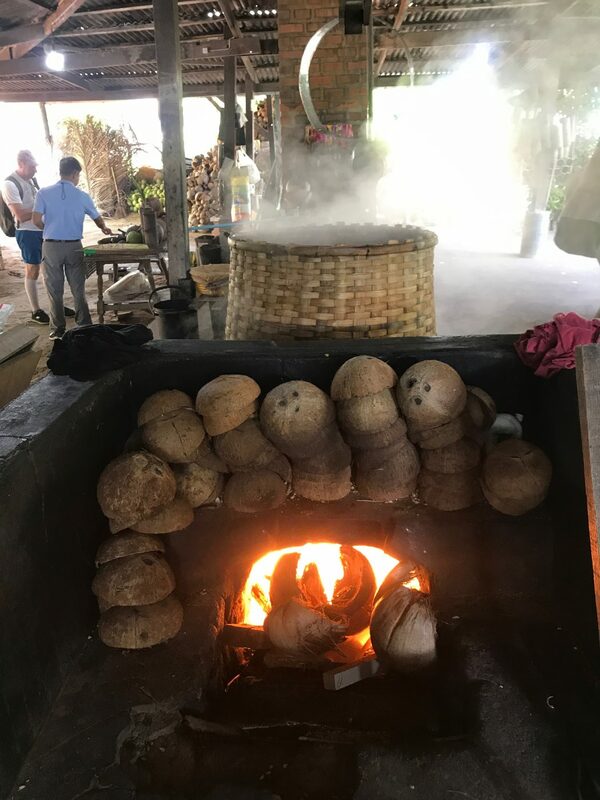 The province is famed for its rich tradition of pottery, this tour gives you a chance to learn more and understand where those traditions come from. We spent about an hour there but I know some other people will stay longer. You’ll get introduced to everything with a short video, take a walk around and then the fun part where you get to have a go at it yourself! Once you’ve finished creating your masterpiece you give the guys your contact details and they’ll send it home to you. 100% yes! I think it’s a great day out, yes you have to start early but it is well worth it. 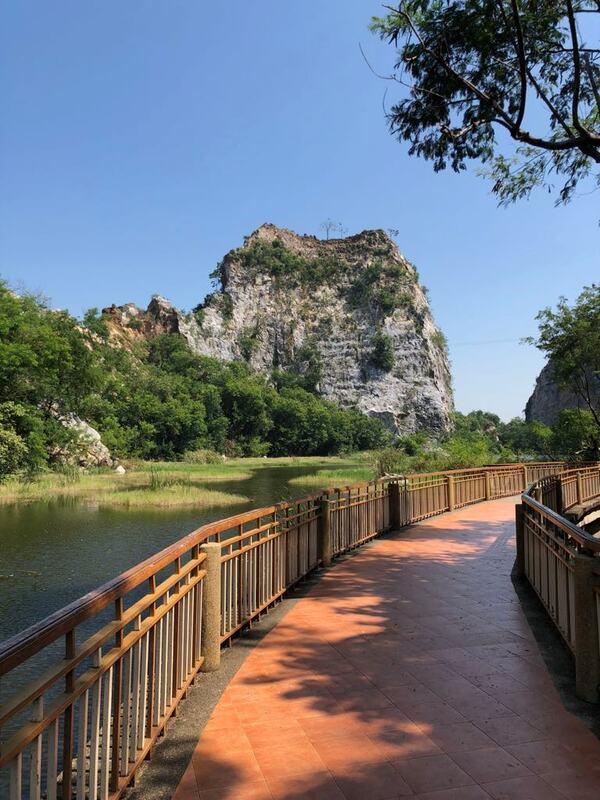 It’s fairly easy to tick most things off the list in Bangkok quickly, so a tour in Ratchaburi is an ideal choice for people looking to get out of the city. Next time someone visits me in Bangkok I’ll be taking them on the tour for sure! Can You Book Hotels In Shimla For Your Honeymoon Trip?